How to find us, see inside, get directions. Follow us on Social Media to keep up to date with our seasonal opening hours. LOOKING FOR A BAR NEAR YOU? 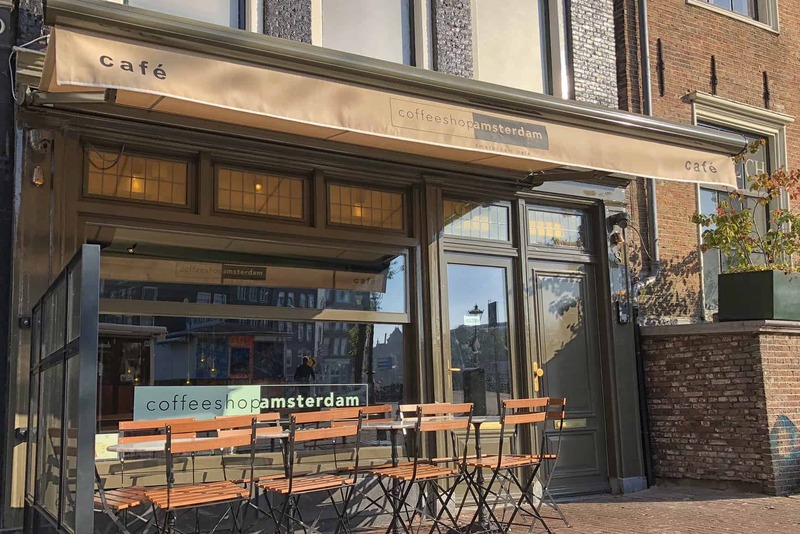 Singel 8 and the Amsterdam Café from coffeeshopamsterdam are located just a few minutes walk from Amsterdam Central Station and our very own Coffeeshop on Haarlemeerstraat. Across from the café is the famous Singel canal, a popular route for many sightseeing tours. By clicking the Directions link, Google will create directions from your location straight to our front door. No matter where you are in the city, it’s easy to find your way to us and you can be sure we have a warm welcome waiting, especially for you. Don’t forget to save us to your favourites so you can easily find us again! Take a look round inside and familiarise yourself with our café before you visit. Simply use your mouse or keyboard and enjoy a virtual tour. Take a few moments to explore our beautifully decorated interior. Two floors, each of which has been individually styled to give them a notably different feel. Immediately you notice the gorgeous gold mosaic wall, which teases you towards the bar. To say nothing of the beautiful green leather sofa and picture wall which dominates the opposite side. Beneath, the fully air-conditioned basement features exposed bricks walls complemented with dark wood, gold furnishings and industrial finish. Reach our location the easy way. Use the map above and find your way to us using the footbridge, easily avoiding the busy roads and usual tourist route.